Amazing figure of Gary Lockwood as an astronaut! Highly detailed 1960s head sculpt of the actor with carefully painted skin texture. Seamless Phicen body features over 40 points of articulation! Odyssey through space and time with this amazing figure of movie actor Gary Lockwood as an astronaut from one or two years after the turn of the twentieth century! 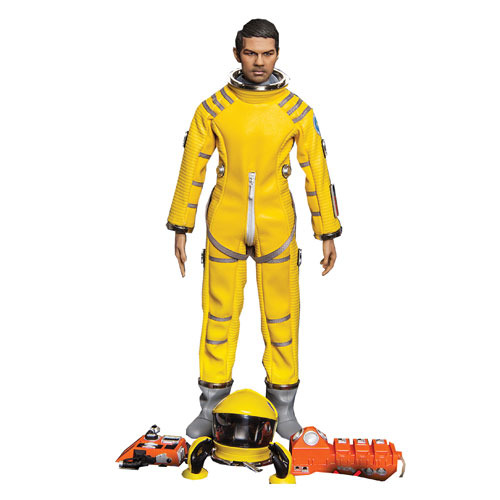 This 2001: A Space Odyssey Gary Lockwood as Yellow Astronaut 1:6 Scale Deluxe Action Figure features a highly detailed sculpt of the film actor's likeness from the 1960s and come with character-appropriate accessories. Complete with interchangeable gloved and regular hands, the astronaut suit and boots are removable, and the character includes an oxygen tank, a front control unit, a space helmet with connecting hoses, and connector rings! He even comes with an action figure display stand! 1:6 scale Phicen figure measures 12-inches tall and features over 40 points of seamless articulation! This action figure comes in a large black rectangular box reminiscent of the Monolith from the film! Figure out more than 2001 things to do with him! Gary Lockwood is a self-described cowboy-surfer, actor, rule-breaker, risk-taker, woodworker, and chef. Working in television, film, and even Broadway, Gary appeared in Tall Story with Jane Fonda, Splendor in the Grass with Natalie Wood and Warren Beatty, and It Happened at the World's Fair with Elvis Presley. Gene Roddenberry cast Gary to star in his TV series, The Lieutenant, which led him to star in the Star Trek pilot, "Where No Man Has Gone Before."